Introducing a new range of cocktail-flavoured macarons from The Real Macaron Company. Join us for a complimentary glass of bubbly and enjoy a relaxed tasting evening with the opportunity to pre-order your choice of macarons for Christmas and New Year celebrations, and benefit from our special festive offers . Places are limited so please book early to avoid disappointment. Only £5 per head. Exciting changes at The Real Macaron Company – August 2016. When I first started out on this macaron adventure, my original plan was to teach Master Classes and create bespoke macarons for weddings, corporate events and other celebrations. Since opening the shop in Newbury, in November 2014, the business has taken off at a great pace and I am absolutely delighted with the results of the last two years. As a consequence of this success, I now wish to fully focus the business around its key aspects – the Macaron Master Classes, Weddings and Events and smaller, bespoke orders. From the 1st August 2016 I will be closing the coffee shop, in order to dedicate more time and creative energy to the core business. The Real Macaron Company is NOT closing down! I am simply moving the business in a new direction! 41a Newtown Road, Newbury will still be the hub of The Real Macaron Company. I will continue to host Master Classes and ‘Bake with Me’ Classes at the premises. With more time to devote to this side of the business, I have plans for new and exciting events and activities. I will also continue to regularly bake in the shop and will be able to take on even more orders – large or small – whether for your weekend treats, or for special celebrations or parties! Orders can be placed as normal by phone, email or via the website and you will be able to collect from the shop, by arrangement or even benefit from personal delivery. Details will follow. I hope you will continue to support me in this exciting venture. If you have any questions or comments, please do not hesitate to get in touch with me. I really want to ensure everything is clear about the changes that are being made, and that you all continue to enjoy Real Macarons! We are delighted to be celebrating our first anniversary of opening The Real Macaron shop in Newbury on Friday 6th November. The year has flown by and the business has grown from strength to strength. Masterclasses continue to be extremely popular and we are now booking into January 2016. 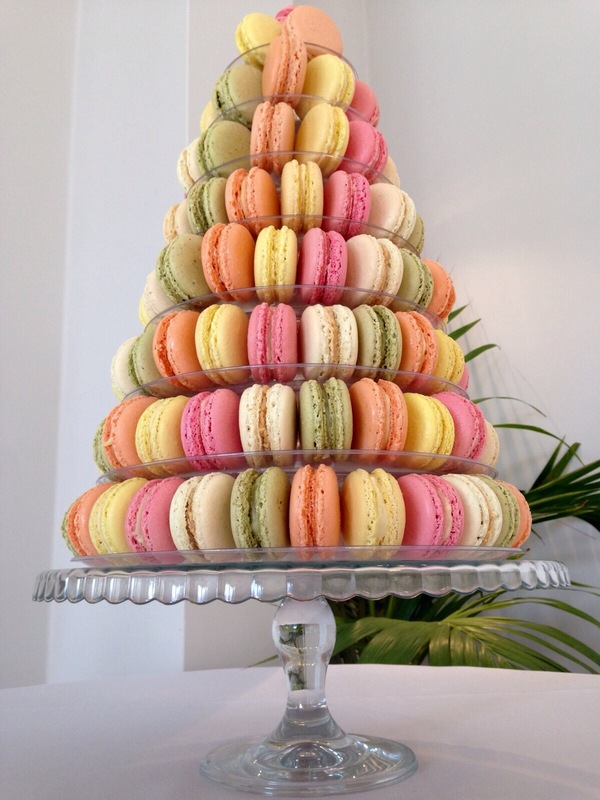 Our Macaron towers, celebration cakes and prettily packaged favours have held pride of place at many weddings, parties and special events throughout Berkshire, Hampshire and Wiltshire this year and the order book is filling up quickly for 2016. Our corporate and charity clients have created some unique gifts and showstoppers for their clients and staff members using our macarons in bespoke colours and flavours to suit the occasion. Our Come Bake with Me sessions for young children have proved tone a great success and we are looking forward to encouraging more kiddies to enjoy creating and baking their own sweet treats! The coffee shop continues to be a happy meeting place for many local people – older and younger – and we hope that as many of you as possible will drop in tomorrow and join in the celebration. Complimentary fizz and macarons for all from 10.00am. Pretty summer colours for a wedding dessert tower.